Our idea came from the Wizard Of Oz one of peoples all time favorites. 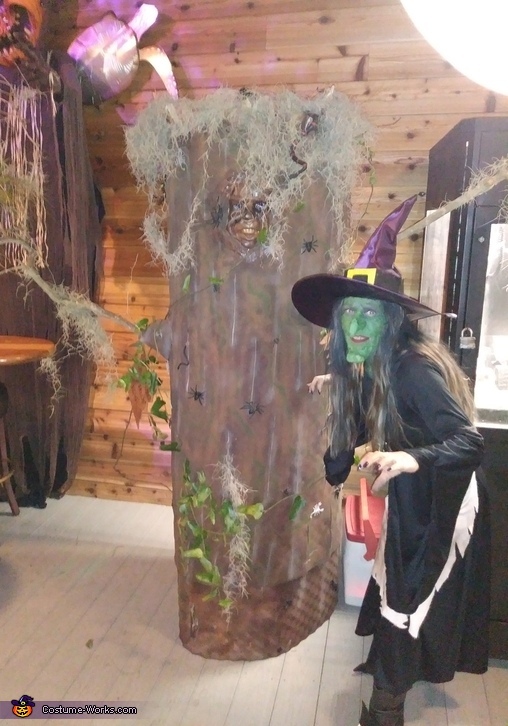 I am wearing the wicked witch that I made from a long black dress, I took a pillow case and cut it longways to fit around my waist, I took different color spray paint and sprayed on it to look dirty then I took fake blood and smeared on my hands and wiped them going upward on the apron. I used my old wedding witch hat yes I had a halloween wedding and took everthing off it and made a black and yellow belt out of felt and glued it around the hat. I also made theboot covers the same way. I bought the nose and chin along with green makeup and added other makeup from my own . My husband wore the haunted tree we started with chicken wire we had and rolled it out and formed a circle and tied the ends together with straps. we took the mattress pad off our guest bed and wrapped it around the outside of the chicken wire and attached it with spray glue and we put a ferning strip on each end for support. We cut out two notches one on each side for tree limbs to stick out of. We cut out a hole in the middle for a face mask to fit into. we took old pieces of wood and broke them up and attached them around the top inside of the tree coming out the top. we left a opening in the back between the chicken wire ends and attached a brown sheet on with staple gun then cut a big long slit in the middle and added felcro for easy in and out. we bought a couple kinds of spray paint and different kinds of bugs, snakes ect. to put all over the tree. we went into the woods and got out tree limbs and moss and vines that we added . we also hooked up a light which makes it glow thru the tree with the slits all over it. We also put a fog machine on top so it looks like it's in the forest creepy . Halloween is about scary creepy things so we like to stick with that besides we had a halloween wedding what a blast. Thank you for looking.